Insp. Inskip: Look, all of the evidence we have got to date, points to something which is half human, half animal. Not the best of British atmospheric spooky drama. 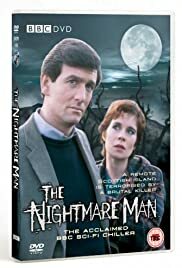 Nobody does spooky, mysterious 'out in the boonies' drama as well as the British... and the late 70s to mid eighties was a great time for them, too, Armchair Thriller, Chiller, Tales Of The Unexpected, The Agatha Christie Hour and many more besides! Unfortunately this one isn't one of them. The 'style over substance' approach, which can often work well in these types of programs, falls flat here. Most irritating is the screen play, which is constantly forcing silly ideas into our heads... "What if the mysterious thing killing the sheep is a monster from outer space?" There are ludicrous attempts to shower the viewer with suggestions of what's going on through the screenplay which makes the entire relationships between the characters a little forced. When the military enter the scene, they seem to embrace the locals and tell them everything that's going on. Soldiers running over a heath comes off as silly and time-wasting. James Warwick does a wonderful job of staring off into the middle distance and getting annoyed over nothing... Celia Imrie has the best eye makeup artist in entertainment and provides an insane amount of 'Doctor Who assistant' style exposition along the way.. There are a few vague similarities to other TV programs of that time, especially from children's TV like 'Timeslip', 'Ace Of Wands' or 'Children Of The Stones', etc. In fact, I wouldn't be surprised if this was originally intended for kids and spruced up a bit for adults in a production meeting. It has a small amount of nostalgic value but ultimately this is silly and forgettable.